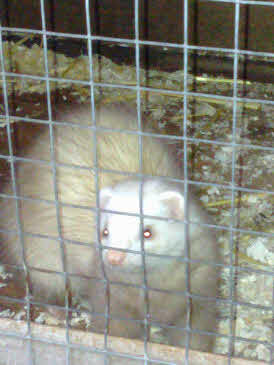 This is Sandie, one of the two last ferrets Fred owned before his retirement from ferreting, passing ownership of both to me. 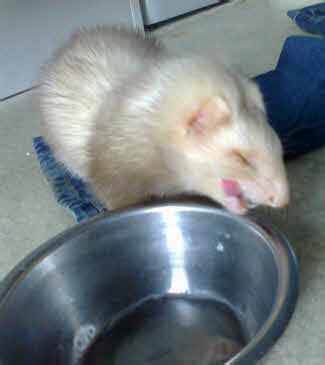 She is the last ferret ever worked by Fred with me as his assistant. She is a big girl, very strong, beautifully proportioned. That said she is very tame and friendly and was dragging her cage mates Milly and Daisy in a protective motherly fashion inside the cage or out during the summer months 2015 when Jills might believe they have young. During 2016, I took her to the vet because she seemed out of salts one hot day, although she seemed to recover, it was noted that there was a growth that could be felt in her abdomen. Considering her age it was decided to do nothing and let things take its course. During December I noticed she was getting thinner as elderly ferrets do, but she was eating well, was alert and active with a god quality of life. On New Year’s day 2017 she came out for her food as usual, but seemed unsteady on her feet, that evening I had to lift her out the sleeping quarters as she had lost strength in the rear legs. That night she spent indoors in the warm, the following morning I took her to an emergency vet’s as it was a bank holiday. There I was asked her age that I estimated at six or possibly seven years old, the vet said there was a tumour and advised that she was put to sleep, which I consented to, having half expected that outcome.